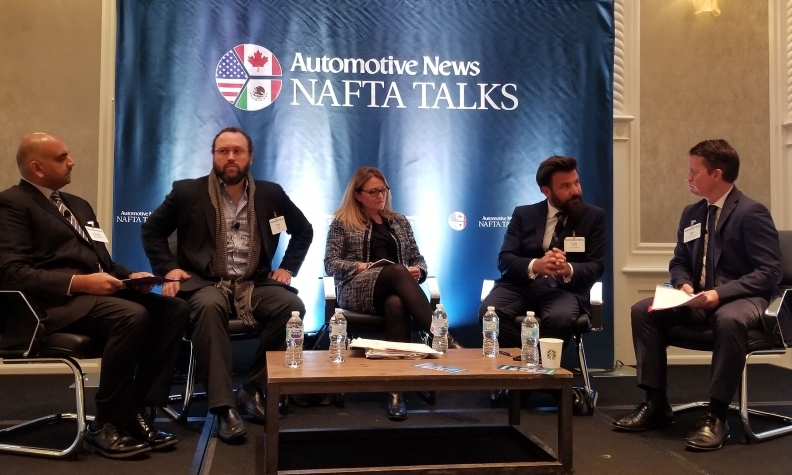 DETROIT -- A panel of trade experts on Wednesday urged auto suppliers to mobilize politically and rescue the North American Free Trade Agreement as negotiations with Canada and Mexico continue to sour over hard-line U.S. positions. "The U.S. productive sector -- from agriculture to technology to autos -- has to raise its voice together and just say this agreement works for our benefit and it needs to be maintained," Kellie Meiman, managing partner at Washington, D.C.-based McLarty Associates and a former U.S. trade negotiator, said during a breakfast discussion here organized by Automotive News. The message needs to be simple and clear, leaving rules of origin and other details to be hashed out later, she added. The automotive supply chains that have evolved over the past 23 years under duty-free shipping rules that encourage cross-border investment are in jeopardy from a Trump administration focused on economic nationalism and reducing the manufacturing trade deficit. Private sector interests now realize they can't convince the White House of NAFTA's economic benefits and are looking toward Congress as a bulwark against any potential attempt to withdraw from NAFTA. Meiman said automakers, suppliers and other industries must band together and make the case to members of Congress, especially those on the Senate Finance Committee and House Ways and Means Committee, and delegations from states that rely heavily on trade with Mexico and Canada. Congress could hold the keys to any ultimate disposition of NAFTA because even if President Donald Trump executes a withdrawal provision, only Congress could unravel domestic laws that implemented U.S. obligations, but how such an unprecedented process would unfold is legally murky, according to trade attorneys. Emilio Cadena, CEO of Mexican auto consultancy Grupo Prodensa, also urged suppliers to make their case to governors, who often wield political power that presidents respond to. "Support your associations on the lobbying effort. Activate your local congressman to make sure they protect you," he said. Canadian Tier 1 supplier Magna International has met with U.S. senators, congressmen and governors, Scott Paradise, vice president of marketing and business development for the Americas, remarked from the audience. The experts said NAFTA supporters also need to be more vocal in their advocacy because lobbying quietly behind the scenes has not worked. From left, Krishnan Anantharaman, an Automotive News news editor; Flavio Volpe, president of the Canadian Automotive Parts Manufacturer's Association; Kellie Meiman, managing partner at McLarty Associates; Emilio Cadena, CEO of Mexican auto consultancy Grupo Prodensa; and Automotive News Publisher Jason Stein, on Wednesday's NAFTA panel. Business groups made a strategic decision early on to downplay the negative implications of the Trump positions in hopes a deal could be salvaged, but are now organizing a public defense because "the negotiations are in bad shape. We need to assertively and realistically make the case," Meiman said. Flavio Volpe, president of Canada's Automotive Parts Manufacturer's Association, said he is making frequent trips to Washington and using the media to let lawmakers know that taking protectionist measures against Canadian imports will injure U.S. companies, too, noting that Canadian suppliers have established 150 plants with 46,000 jobs since NAFTA was enacted. "We don't fly our flag in front of our shops, but we point out to them that the plant in their district employs many Americans and that you can't put a fence around the different national interests" when the industries are so integrated, Volpe said. U.S. politicians need to realize that if NAFTA unravels, China will be the big winner and the domestic auto industry will suffer, Volpe said. He warned that the rapidly growing Chinese auto industry will corner the market on electric vehicles that can be sold at mass-market prices, as it did with solar panels, and import them to the United States in large quantities. GTSI, a family-owned tooling manufacturer for the auto industry in Laredo, Texas, has created a YouTube channel to promote the importance of trade to the city and the need to defend NAFTA, GTSI President Alma Acevedo said after the event. 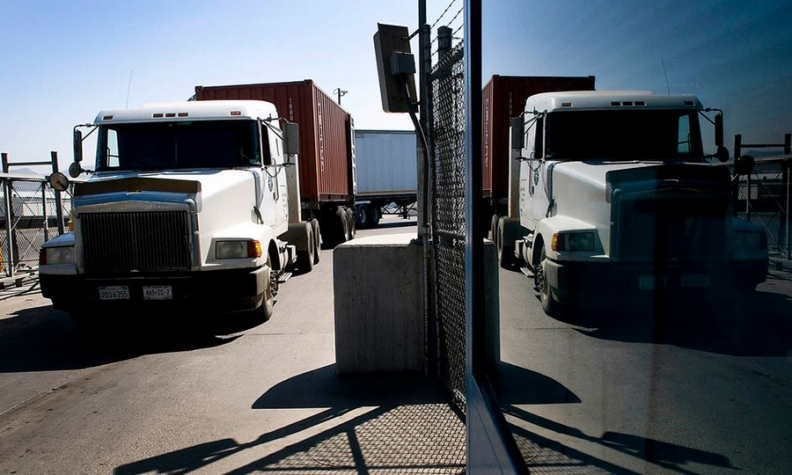 The fifth round of NAFTA negotiations is scheduled to take place Nov. 17-21 in Mexico City.